As much as I was looking forward to seeing documentary The Genius Of Marian, a large part of me was dreading it knowing that I was about to sit in a dark room and watch a story that was about what I live day to day. When I usually go to the movie theatre, it's to escape, relax and forget. 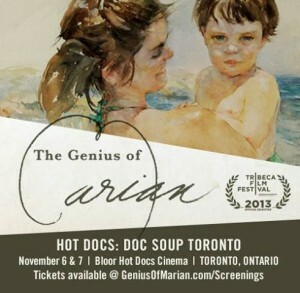 [caption id="attachment_1954" align="aligncenter" width="300"] The Genius of Marian played at Toronto's HotDocs[/caption] Not even five minutes in I felt relieved meeting the film subject, director Banker White's mother, Pam White, who lives with early-onset Alzheimer's. Full of love for her family, happiness in her home and passion to continue her life as independently as possible she reminded me a lot of my mom, also living with the disease. For me, this made the movie incredibly easy to watch as I felt understood and supported by the family on the screen.